Killington Region - Sleeps 19! This historic 1840’s house has undergone a COMPLETE gut renovation and combines modern amenities with streamlined country tradition. The perfect getaway for city slickers who want to have comfort within their country retreat. This 4700 square foot lofty beauty sleeps 19 in 6 separate bedrooms and a sleep loft. The breakdown of beds is listed below. All beds are on the floor (non-bunk beds). Second floor living room with flat screen HDTV, cable and WiFi, DVD/sound system and electric fireplace. ADDITIONAL loft living room with cable TV, DVD, stereo and pull out love seat and many board games. There is a whole-house sound system for your smart phone. Large bathroom on 2nd floor has a steamer shower which holds 5-6; 5 ½ total bathrooms with all showers custom made and tiled and accented with plush white large Egyptian towels. Seating and table settings for all in the dining room. We have work with several talented private chefs who are available if desired for a special meal, or even all of your meals during your stay. We serve farm-to-table seasonal fare that showcases Vermont's glorious food scene. Please let us know if you are interested in a catering quote. The chef's kitchen features stainless steel appliances including dishwasher, 6 burner range, stackable convection oven, granite counter tops, microwave, 2 refrigerators, small freezer, ice maker, instant hot water machine and a highly filtered water system, as well as in-house washer and dryer. The kitchen is fully equipped to make cooking for a large group a breeze. There is a separate yoga room, with yoga mats and props (blankets, blocks, et al.) for up to 28 people. Could also be used as a rehearsal space, or for conferences, etc. Pets are okay with pet cleaning fee. All beds, linens, towels are BRAND NEW. 15 minutes to Okemo, 10 to Killington Skyeship Gondola. Recent improvements include complete weatherization and conversion to solar power for electricity. Good Commons is now a property that only relies upon fossil fuels for 10% of all electrical, heating and cooling needs. Central air has been added to the sleeping areas, and a new hot tub was installed in the spring of 2016. More pictures available upon request. This lovingly restored gem is perfect for families, a large group of friends or even a retreat group. Endless activities are at your fingertips, and the beauty and serenity of Vermont is at your doorstep. I was raised on a dairy farm in rural Illinois and began doing back flips off the stereo when I was two. Before I could read a novel, I was doing full tumbling passes across the floor of a gymnastics class. Soon, I became Jr. National Champion for the United States Acrogymnastics Federation for mixed pairs — think Cirque de Soleil packed with a cast of overactive children. My childhood dream came true when I was cast in the role of Rumpleteazer in Cats on Broadway. After Broadway, I directed and choreographed many shows regionally and off Broadway, and I served as a choreographer for five seasons at Vermont’s famed Weston Playhouse where my love affair with The Green Mountain State began in 1999. Suffice it to say, I was on a pretty short ladder to theatrical success when suddenly everything changed. I had a new inspiration… In 2003, I awoke from a dream with a powerful sense of urgency. “You will open a center…” This mantra was echoing in my head as I rubbed my eyes, and it wasn’t going to fade… Mid year 2006, I traveled to Vermont to watch my best friend perform at the Weston Playhouse and saw the real estate listing for what would eventually become Good Commons. The walls of this old general store/home hadn’t seen a family live through a Vermont winter in over 25 years! But from first view, I knew it held outstanding potential, and the initial shell of Good Commons satisfied my dream list for what I thought that “center” meant for me. My childhood dream came true when I made my very first entrance on Broadway in 1998. The dream I was only able discover as an adult comes true around me at Good Commons every day. There have been many angels that have helped turn this old building into a beautiful home for relaxation, rejuvenation and a rockin’ good time. I am grateful that they have joined me in my dream, and I look forward to meeting you in it as well. Bathroom 4 has a steam shower. 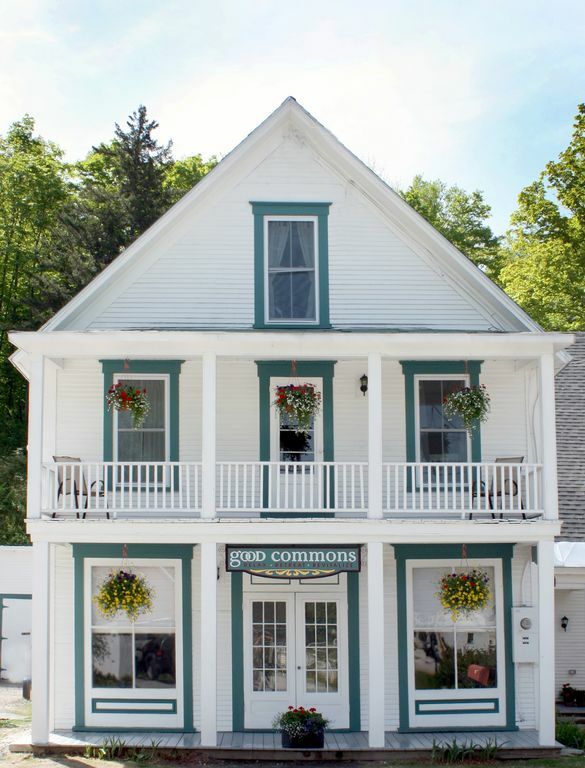 Good Commons is located in the heart of the Green Mountains. Two major ski resorts (Killington and Okemo) are a short drive from the house. We are proud to be a property that only relies on fossil fuels for only 10% of our heating, cooling and electrical needs. One-time bed linen and towel setup is included. You do not need to bring any linens. Bath towels and spa towels for the hot tub are provided. Basic kitchen spices and cooking sprays, along with refrigerated condiments are provided. Private Chef Services available, please email us for pricing and info on chef services. Our chef-owned property features farm-to-table, mostly organic, seasonal fare. Whole-house sound system for your smart phone with two input sources and speakers in all common areas and the back deck/hot tub area. There is a large fire pit in the back yard. Firewood is supplied. MAY NOT BE ACCESSIBLE IN THE WINTER. Reading balcony on front of house - summer use only. 10-15 min by car from both Killington Resort and Okemo Resort. 7-person, 4-season outdoor hot tub. Outdoor fire pit (may not be available in the winter). Firewood provided. Onsite yoga classes, massage services, hiking and skiing or snowshoeing guides are available upon request. Thank you so much Ami for the lovely review! You were a pleasure to work with, and we'd love to have you come back any time. I brought a sales team on a retreat and was so pleasantly surprised with how beautiful this house was. The hot tub, yoga studio, and steam room/shower were amazing after a day of skiing on Killington mountain. Thank you Sam for your nice review! We were happy to work with your group and would welcome you back any time. Please keep in touch! This house is perfect for our type of groups. Thanks Rene! We'd be happy to have you back any time! We had a family vacation of 15 people and Good Commons was the perfect house. It was very spacious and had everything we needed...Large kitchen and plenty of beds, linens and bathrooms. The owner was quick to respond to us when there was an issue. There was a huge snowstorm and our parking area was quickly plowed. The temp dropped to below 0 degrees and the house did not feel cold at all. Thank you for a wonderful stay!! Thank you so much Cathy for your kind review! We would love to work with your group again any time. Thank you also for the quick communication while you were onsite. We appreciate that very much. We're so happy that you got to enjoy a true Vermont snowstorm while you were here too - that was a fun one! We had a large party ... 19 total. The house was comfortable and easily supported our group. We stayed over NYE and had Good Commons catered our dinner. IT WAS FABULOUS! Highly recommend the catering services!! Thank you so much Kim for allowing us to host your group at Good Commons and also to cook your New Year's Eve dinner! Our entire team really enjoyed meeting and working with you and your friends and family. We also truly appreciate your kind words about the meal that we catered. We hope to see you again next winter! We had our yearly ski trip to Killington this year at good commons. The house is very charming with all the things we could expect. Clean beds and plenty of bathrooms for 19 guests. Upgraded kitchen we used for cooking our own meals every day. The third floor loft is a big hit among all the kids. Easy access and good location to our ski destination. Owner and manger is super nice and supportive. If you have and questions, they are helping you with all the efforts. Really enjoyed our stay and looking forward to come back in the future!! Thanks a lot Mary and Tesha!! Thank you so much Bing! You were an awesome family to work with and we look forward to having your group back any time you can come. Rates are subject to change until reservation is confirmed. Rates INCLUDE cleaning, linens and towels. Pet Fee will be $150 if manager is not notified in advance of any pet guests, otherwise the Pet Fee is $100. Please also note that our standard payment schedule is $800 + $99 property damage protection policy due to confirm the booking, along with your booking fees to HomeAway/VBRO. The balance will be divided into two equal payments. The first one will be due 60 days prior to check in, and the second one will be due 30 days prior to check in.